What could you say to a man about his painting? What could you say that would impress him and yet let him know that his work has informed your own struggle to learn throughout your life? John Schoenherr’s work has been a part of my life since I was a kid, looking at an Analog cover in my favorite drug store. I was drawn in by the mysterious shapely woman in a tree, accompanied by her gigantic otter. From across the store one could tell that they were friends. This is when I began to realize that painting could not only be fun, it could touch an emotional chord. From an early age I could tell that John’s work had a certain kind of stiffness in its application compared to other great painters whose brushwork was supple and relaxed. John’s had a rigid quality to it that couldn’t be avoided, yet it’s graphic composition was unrelenting. He captured light in a graceful manner, pulling your eye to just the most important elements and finished it all like the power of a museum piece. In all of my art school years, I knew a painter when I saw one. I was never tempted to exclude a commercial artist’s gems from a life dedicated to the almighty gallery world. John’s work showed me that painting transcends application when it truly touches the spirit, whether it was a subtle portrait of a renaissance woman, an experiment in abstract color, or a humungous sandworm cresting a dune. The fact is, you can’t really say much to a painter like this that wouldn’t make you sound like a simpleton, or the uber fanboy. 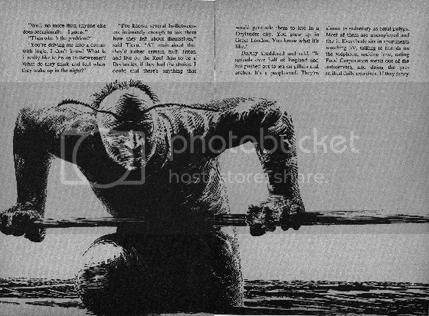 I never got to meet John Schoenherr. He passed away April 8th having expressed what I believe he must’ve surely loved to paint right up until his last day. And every artist after him that I have ever enjoyed or has shown me how powerful painted images can be, I will thank them, profusely, like I wish I could’ve mustered the will to do with John. Thank you, John, for leaving so much work I will never tire of. Thanks for sharing that Greg, and for introducing him to me. I can see the influence in his epic intimacy. You're right, the evoke thoughts, feelings...nice. I still think of John Schoenherr's work for Dune as the most quintessential covers the series has ever seen. They shaped my vision of Arrakis before Herbert's words even entered my brain. They are -still- inspirational to me. What a wonderful and kind post. John Schoenherr's Illustrated Dune is, and has been one of my favorite art books since I was a kid. It came in a box of sci-fi books my Dad won at a local auction. I still have it, in fact I was just showing it to people I work with last week. It's not just filled with wonderful paintings, but his pen and inks that grace the interior of the book have so much life in them, you'd swear he just scribbled them out. Upon inspection though, you can tell they're the careful lines of a true draftsman. I'm sad to hear he passed. I had always hoped to meet him and shake his hand. His Ornithopter design still has never been outdone, and frankly I don't think ever will be. I appreciate what you and your commenters have written. It's heartening to know that my dad's work has had a powerful and lasting effect. Funny, I came across the otter painting in his studio the other day. 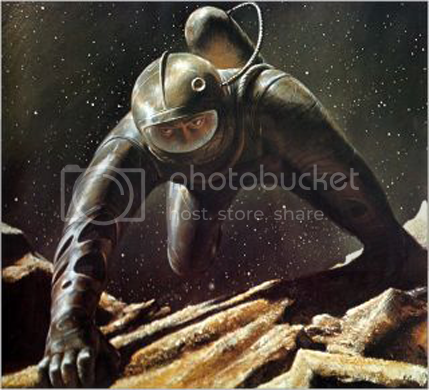 And the "Man Into Space" cover art hung at the foot of my bed when I was a boy. I called it "The Man With The Cloudy Eyes" and it scared the hell out of me. It still does, a little. What an inspiration his work was. His images always put you 'right in the piece' without a lot of fussy details. The look ofd Dune will always , for me, be the way he painted it. And his work in children's picture books was very different, at least on the surface but had no less of an emotional connect to the viewer. His paintings for Owl Moon (one of my favorite PB's for both the art AND the writing) were stunning in their simplicity. I didn't realize he still had it, Ian. That's great. That painting in particular I've stared at for so long, yet it still touches me. Funny about the "Man Into Space" painting. I can see how that might've been a little strong to a kid. Do you think you might do a retrospective of your father's work? I bet the Society of Illustrators might be interested. All best for you and your family. Wonderful, heartfelt apprection Greg. Would love to see a retrospective of John's work. His work is and will forever be an inspiration to me. I had the pleasure of knowing John for a period of time as a friend of family. He and his wife and family were such fascinating and warm hearted people. He was quite humorous and wise and his environment was a real curiosity shop. He was a great influence on so many people who knew him. I was impressed with the world he created and shared with others whether in his art or his life. Ian - I’m honored that you stopped by. I've long admired your father's science fiction and children's book work. 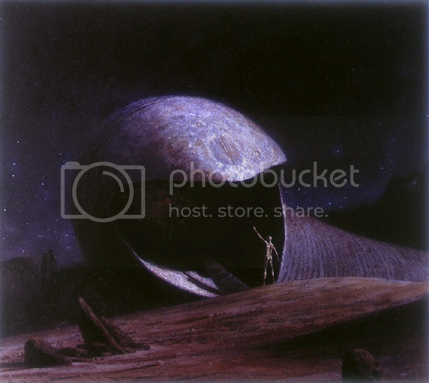 I have had the pleasure of seeing some of the Dune paintings at Robert Wienier's house. I only recently stumbled onto his wildlife art online and was floored by it. Beautiful, beautiful work. You're father has so many dimensions to his art...obviously he has touched a lot of people. What a wonderful post. 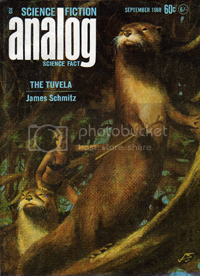 I still have that Analog with the otter cover. It's always been one of my favorites. Just last week for some inspiration, I pulled out the "how to paint animals" (I think that's the title) that Mr. Schoenherr did for Grumbacher years ago. His work seemed on the surface so simple and yet on second look it definitely was not. Refined would be the word I would use. So very refined. I am sad for his passing. A very touching commentary, Greg. Well said. It's amazing how John's art touched us at such a basic level. His hey speak to creatures were so real. His wildlife paintings were always like stepping into a field. I look at the pieces I own, and they speak to me even now. 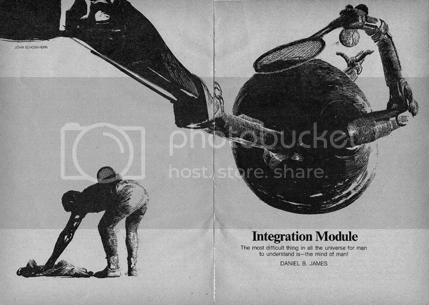 I own the Integration Module, Longest Voyage and Wheels within Wheels Analog covers and I adore them. I have a B&W of three baboons that follow you as you move around the room. Even now, it's been over thirty years since I saw him in his studio, and I still remember how humble and yet forthright he was.